The Bible warns us a religious leader will arise in the last days who will unite the world into a one-world religion. He will have the appearance of a lamb (Revelation 13:11), which means he will appear to be a follower of the Lord. However, in reality he is an imposter and a deceiver. His true identity is the second beast, the false prophet. His campaign to unite the world’s religions will ultimately lead people of all faiths to come together for the purpose of worshiping the first beast, the antichrist. Only a religious leader could fulfill the requirements of having the appearance of a lamb and leading the world in worship. So believers have been warned in advance to be on the lookout for this leader. Our alarms should be blowing when we see someone taking actions to unite the religions of the world. However, since the Bible does not tell us the dates we are instructed to be on the alert, be sober, aware of the schemes of the devil. We are warned not to be spiritually asleep like those who are in darkness. The Lord Jesus warned his followers, “Be on the alert then, for you do not know the day nor the hour (Matthew 25:13). So those who are committed to obeying the Lord should be paying close attention to the events happening in the world around them. Today we see a religious leader taking action to unify the religions of the world in ways that are unprecedented. His name is Pope Francis, the leader of the Catholic Church. I honestly don’t know if he is the one described in the Bible. However, his actions qualify him to be on my watch list. It is a very short list. He is the only one on it because no one else is currently even close to meeting the requirements. Pope Francis appears to be on a crusade to unite the religions of the world into one. He started fast right out of the blocks and has not slowed down. 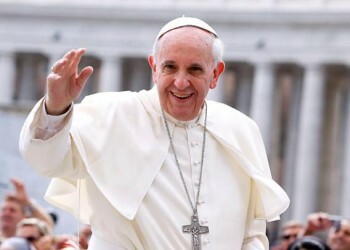 Since being elected Pope on March 13 2013, he has launched initiatives to reconcile differences between leaders of every major religion, including longstanding rifts between Christian denominations. This message of unity has been his ongoing theme in meeting after meeting and nation after nation. He has not only sought unity among Catholics, but has ventured much farther than any previous Pope in reaching out to people of other religions. It appears he is having great success because he is getting warm receptions from people all over the world from many different religions. He has even been warmly received by spirit-filled believers who are embracing him like a brother in the faith. The following provides a few examples of his worldwide campaign for religious unity. On Sunday June 1 2014, Pope Francis sought unity among his own Catholic Church by meeting with over 50,000 Catholic charismatics at Olympic stadium in Rome. Catholics from 55 countries attended. Pope Francis admitted he was not always comfortable with the way they prayed, referring to the fact they prayed in tongues, but allowed them to pray for him anyway for the sake of unity. The image of Pope Francis was projected on a giant screen as he delivered his speech. 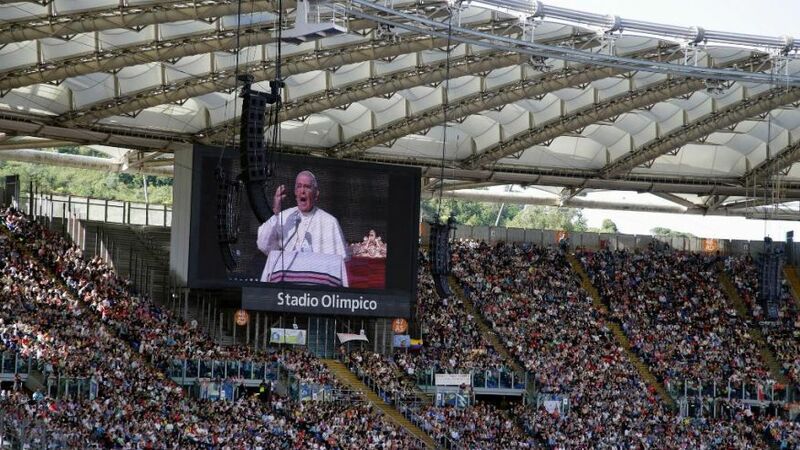 Pope Francis speaks to Charismatic Catholics at Olympic Stadium in Rome, Italy. On Sunday, June 8 2014, Pope Francis took an unprecedented action for a Pope when he brought together Muslims, Jews, Catholics, and Orthodox Christians to pray for peace in the Middle East. 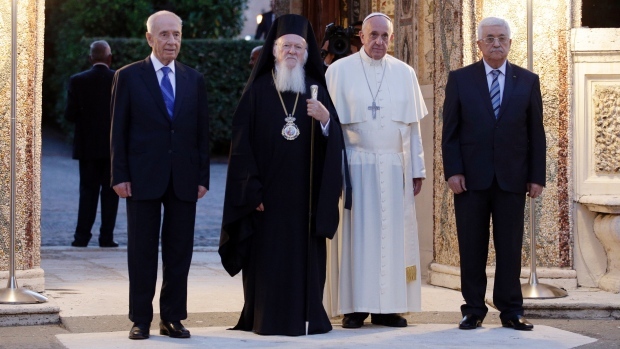 Pope Francis hosted a prayer meeting in the Vatican Garden attended by the President of Israel, Shimon Peres, the President of the Palestinian Authority, Mahmoud Abbas, and Patriarch Bartholomew I, the spiritual leader of 300 million Orthodox Christians worldwide. Prayers were delivered in Italian, Hebrew, Arabic and English. On June 24 2014, Pope Francis took another very unusual step for a Pope by meeting with famous Protestant Charismatic Christian leaders, including Kenneth Copeland, James Robison, John Arnott, Carol Arnott, and others. This is another example of how far Pope Francis has ventured, much farther than any previous Pope, in his efforts to bridge the gap between different religious groups. This meeting came just weeks after meeting with another famous Christian television preacher, Joel Osteen, pastor of Lakewood Church, a mega-church based in Houston, TX. 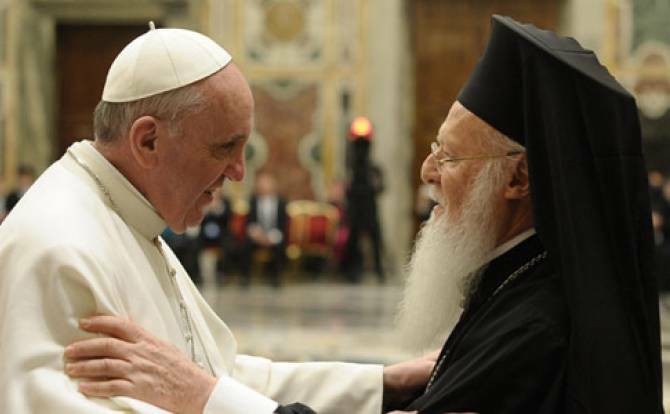 On Sunday December 1 2014, Pope Francis met with Patriarch Bartholomew I, leader of 300 million Eastern Orthodox Christians, attempting to mend their thousand year-old differences. About 500 years before Martin Luther led his protest against the Catholic Church, the Eastern Orthodox Christian Church rejected the ultimate authority of the Pope in what is called the Great Schism of 1054. The Orthodox Christians have been separated from the Catholic Church ever since. However, in this historic meeting they signed a declaration committing to unity between their two churches. 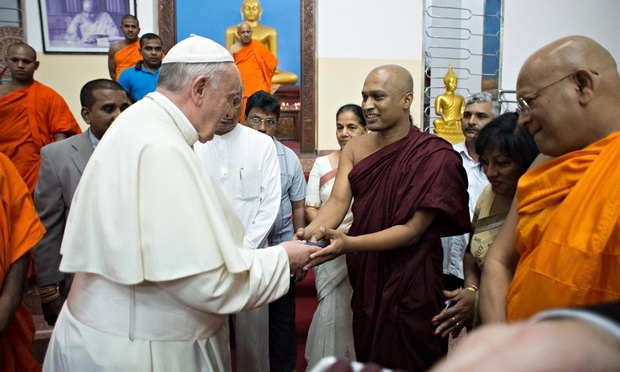 On Wednesday January 14 2015 Pope Francis made a surprise visit to a Buddhist temple in Sri Lanka where he told huge crowds that religions must unite to heal the country’s war wounds. This was only the second time in history that a Pope has visited a Buddhist temple. The last time was by Pope John Paul II in 1984. 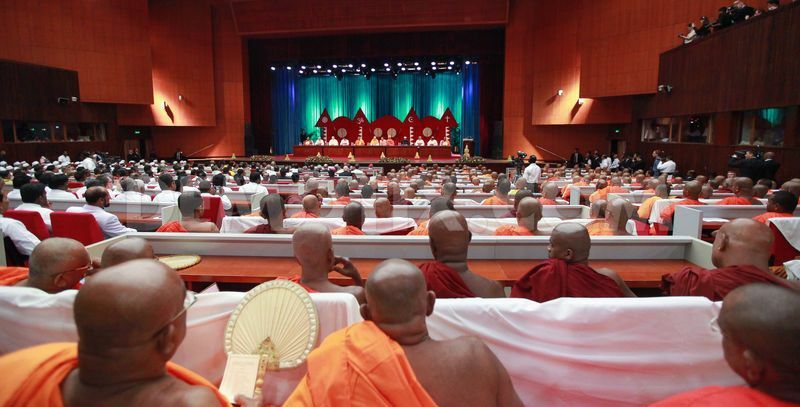 Sri Lanka is about 70% Buddhist. Pope Francis was honored by the Buddhist monks when they opened a container holding Buddhist relics that is normally unsealed only once a year. While he was in Sri Lanka, Pope Francis also met with Hindu leaders. 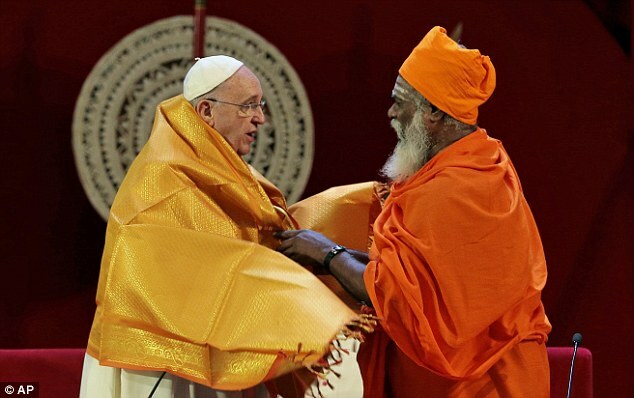 Following his speech at Bandaranaike Memorial International Conference Hall in Sri Lanka, a Hindu priest placed an orange cape on Francis’s shoulders. Hindus represent about 13% of the population of Sri Lanka while only 7% of the population is Catholic. If Pope Francis is the second beast then we would expect to see him taking the very same actions as he has been doing, on his way to forming a one-world religion. We must pay attention because he fits the description of the second beast. His ultimate goal could be to get the whole world to worship the first beast. Believers everywhere should be watching and praying, on the alert, sober and fully awake for the devil comes craftily, cloaked as a lamb. Millions will follow him to their destruction. Those who are spiritually asleep cannot be expected to see what is happening. Therefore it is up to those who are awake to expose the devil’s scheme, to warn others, and to stand fast resisting his schemes. The pope is indeed taking unprecedented actions to unite world religions. Here is a disturbing piece of news: http://www.jewsnews.co.il/2014/12/02/when-the-pope-is-now-entering-mosques-and-praying-towards-mecca-is-it-official-that-the-world-has-lost-its-mind.html. I thought Christ said to judge sins and not sinners. If you all say that Pope Francis is the “antichrist”, what did he do wrong? That is what Pope Francis is trying to do and he is doing it with all his heart. The whore of Babylon is the pope described in Revelation 17. He is anti-christ sitting in the church claiming to be God. the pope is a false prophet, please do not listen to him. he is a disgrace to the Christians world wide. read your bible and listen to jesus words. THE POPE IS A FALSE PROPHET. Let’s not unite as a religion but as a world so that we all can finally make peace and begin to be part of a Greater Community. Numerology is idolatry. You’re on the edge, brother. It is interesting to read that pope Francis just last week said he feels his papacy will be short/brief perhaps just another couple of years or even less he said. He said no matter what he knows he will step down rather than grow old or die while still holding the position. So it is his predecessor I believe who will be the puppet on Satan’s hand who will be the false prophet. Perhaps It is time to revisit the prophesy about the popes and the timelines and names that were prohesized. If we see truth in this prophesy then the next pope should be called Peter the great or some variation there of. Thank you and LORD BLESS you And keep you all! Lightning struck the Vatican not once but TWICE – hours after Pope Benedict XVI’s shock resignation. Ratzinger resigned 21 days after BHO sworn in and Francis made Pope 51 days after BHO sworn in.